Last January, I ran too fast too soon after slacking during the winter and destroyed my right it band. Everything I injure while running is on my right side, it's kinda crazy how much weaker that side of my body is. I spent a long time in physio at the Running Injury Clinic located here in Calgary at Glenmore Landing. I did all the exercises and spent (and still do) hours rolling out my it band and quads on my roller. But no matter what I did, nothing took away from my knee pain (which was a result of a tight it band). 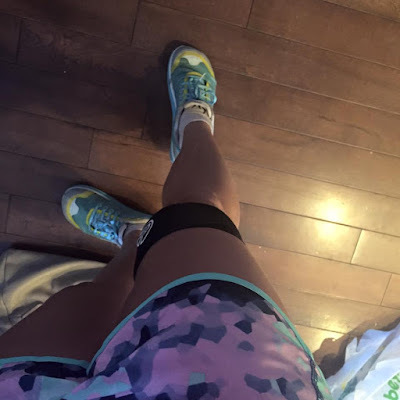 My friend Shannon suggested a knee compression wrap so I went to the Running Room and bought one. I tried it out and ran with it and it didn't help much at all. So I went back and returned it and bought the it band compression wrap instead. It worked. It was amazing. That was last summer sometime, I don't remember exactly but it has been a game changer. The wrap velcros right above your knee and provides targeted compression, stabilizing the it tract and it absorbs stress to the area and reduces friction and rubbing of the femoral condyle (you can find more information here).